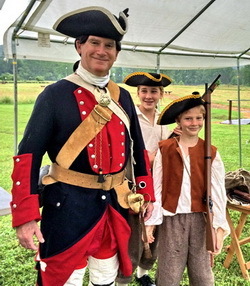 IMPORTANT: The April 20th 1:30 PM Battle of Great Cacapon Reenactment is POSTPONED (now rescheduled to June 15th), due to extreme wet conditions on site from recent and impeding rain. 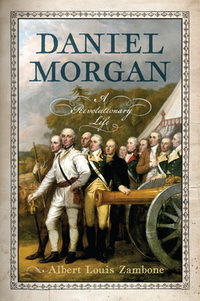 The Annual Colonial Feast and quest speaker Albert Zambone author of "Daniel Morgan: A Revolutionary Life" will still be held April 20th at 3:00 PM, at the Capon Bridge Fire Hall Community Building, as scheduled. Put together your favorite colonial dish and join us for an afternoon of good food and colonial history. If you can't make a dish, join us anyway, we'll have plenty. Colonial Feast at 3:00 PM; Feast of traditional colonial foods. This fun-filled, family-friendly event is held at our site at 350 Cold Stream Road, in Capon Bridge, WV. Witness regiments in period attire performing drills. See various artisans showing colonial crafts. See authentic reenactors and crafters interpret our site, as well as educate and share the artisanal skills of the colonial frontier. Maryland Forces will also display soldiers' skills and customs. Experience the lifestyle of Joseph Edwards and the other settlers of mid-eighteenth century Hampshire County. Creating delicious colonial meals on a campfire! Toast Joseph Edwards and Col. George Washington! Sip wine and celebrate Hampshire County’s fine history. Contact Fort Edwards for an invitation: events@fortedwards.org. Young and old alike will be delighted to have tea with Mrs. Joseph Edwards at the Visitor Center. To celebrate another successful season of historical interpretation and discovery at the site of Edwards's Fort in Capon Bridge, WV, the Fort Edwards Foundation invites all our neighbors and friends to this free afternoon tea as our regular season closing event. 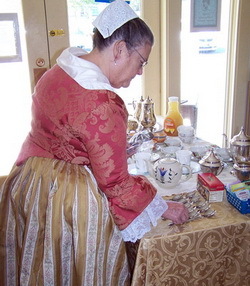 Enjoy sipping afternoon tea while studying colonial dress!